Great breakfast - just wish I could get out of my client in time to have the light dinner. The location was astonishing. The facility provided many amenities that took care of both breakfast and dinner as part of their service. The security was great for an inner city facility. The location was superb and the amenities notable. Oddly enough, the acoustics weren't what they should have been for a metropolitan area. 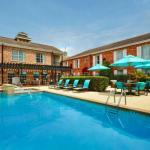 Residence inn Houston galleria in Houston has a bed and breakfast charm in the middle of the city. It's conveniently tucked outside the hub of shopping malls and eateries. It is a perfect stay for leisure or business trips. I would recommend you obtain a final/zero hotel receipt when checking out. Bed and breakfast attitude in the middle of the city. After I checked out, the hotel charged my credit card without my knowledge. Took five days to resolve. The 146 all-suites Residence Inn by Marriott Houston Galleria provides reasonably price accommodation for the business traveler or families on vacation. The three-story, pet-friendly property is located on a residential street a short walk from the Galleria Shopping Mall. Items included with the room rates at this non-smoking hotel are: A hot breakfast buffet, dinner and drinks on Monday through Thursday evening at the propertys Gatehouse, high-speed Internet access, local telephone calls, a morning newspaper, parking and coffee available in the lobby 24/7. Area landmarks and attractions include the Great Southeast Equestrian Center, NASA Space Center, Houstons theater and museum districts, Minute Maid Park, home of the Houston Astros and Reliant Park, home of the Houston Texans. All of suites have a fireplace and kitchen with conventional oven and microwave oven, stove, refrigerator with icemaker, dishwasher, coffeemaker, toaster and a full set of cutlery and crockery. There is a work desk with high-speed Internet access, two-line telephone with voicemail, pullout sofa bed, cable television with cable movie and news channels, hairdryer and an iron and ironing board. This inn has an outdoor swimming pool, whirlpool and an exercise room. The only meals served here are breakfast and the mid week evening light dinners at the managers reception. The inn offers a grocery shopping service. There are several restaurants nearby including the Canyon Café, a Cheesecake Factory and a Mortons of Chicago Steakhouse. The 24-hour front desk has safe deposit boxes and information on area events and attractions. Other amenities include a coin-operated laundry, full service business center, same-day valet dry-cleaning, an ATM, picnic area with a barbecue grill and a gift shop and newsstand. The location of this Residence Inn, just one block from Houstons stylish Galleria shopping complex, is one of the major attractions of this hotel. Many who have stayed here say they received helpful advice and good service from the employees. Thanks to the reasonable rates for spacious suites accommodation, most clients said they would use this hotel on future visits to Houston and would recommend the property to family and friends.